With Stellavox SM8 "master" in order to obtain the best performances of an analogical recorder. Headblock 38 cm/s CEI with heads 2,7 mm (butterfly), erasing and premagnetizing at 128 Khz and now with Lundahl transformers on the mike inputs. I made some really good orchestral recordings with the Stellavox SM-8 over the past 4 days. I recorded both digital and on the Stellavox. The new heads and your electronic work sounds fantastic. Thank you! It is so much better than the digital recording. I'm going to make some cd's and send them to you. In this digital age it is absolutely amazing to find a 1/4 "(!) 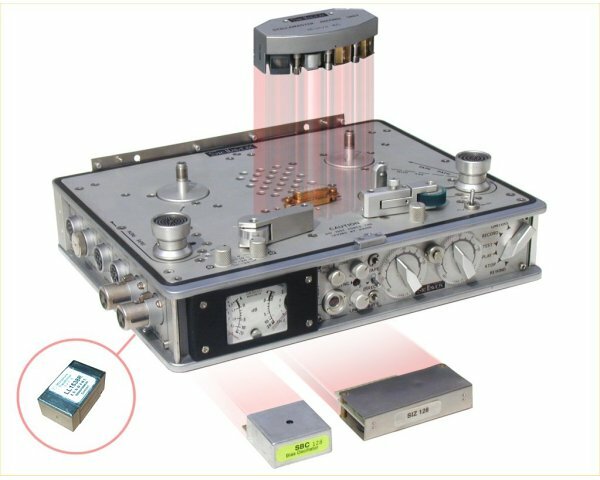 two track recorder that, sonically will outperform any digital recorder, regardless of format and sampling rate/word lenght.I speak from first hand experience, having compared DVD recorder operating at 96k/24bit to the SM8 running at 15ips with a 10 micro second time constant and using BASF 900 tape. The SM8 is utterly transparent!!. The built-in mike pre-amps are also truly excellent and compare with the best out there. Again, I say this after having compared them to a highly touted solid state unit. The SM8 mike pre-amps not only provide 48 volts for phantom powering, but also output 12 volts for those who like certain Shoeps models. I have not tried the built-in limiters as I do not use limiting, but I hear that they too are very good. Besides, the recorder is compact and portable with very useful peak reading meaters. This simple and elegant unit will also run on batteries and work flawlessly from Himalayas to the Dead sea - from Artic to the Sahara and to the Amazon rain forest. In short, the SM8 is a masterpiece, a miracle, a gift form God to the music minded recording engineer. "It is the Patek Philippe of analog recorders". Kavichandren Alexander, Producer/engineer and founder of the Grammy award record label "Water Lily Acoustics".